Moon Jae-in (Hangul: 문재인; Hanja: 文在寅; Korean pronunciation: [mundʑɛin] or [mun] [t͡ɕɛin]; born 24 January 1953) is a South Korean politician serving as the 19th and current President of South Korea since 2017. He was elected after the impeachment of Park Geun-hye as the candidate of the Democratic Party. A former student activist, human rights lawyer and chief of staff to then-President Roh Moo-hyun, Moon served as Leader of Democratic Party (2015–2016) and a member of the 19th National Assembly (2012–2016). He was also a candidate for the former Democratic United Party in the 2012 presidential election in which he lost narrowly to Park Geun-hye. 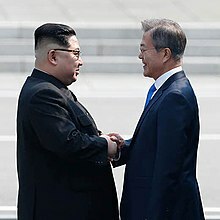 As President, Moon Jae-in has met with North Korean chairman Kim Jong-un at inter-Korean summits in April, May, and September 2018. Yielding to Roh's insistence, Moon became Roh's campaign manager during his presidential bid. After Roh's victory, Moon became Roh's chief presidential secretary and close aide holding various roles in a presidential administration. Moon held roles as Senior Presidential Secretary for Civil Affairs, Senior Presidential Secretary for Civil Society, Senior Presidential Secretary for Civil Affairs, and Chief Presidential Secretary (equivalent to Chief-of-Staff) from 2003-2008. Moon was also the chairperson of the Promotion of the 2nd North-South Korea Summit. ^ "S. Korea's unemployment rate hits 4.5% in January". archive.fo. 2019-02-23. Retrieved 2019-02-23. ^ "South Korea unemployment rises to 9-year high | Financial Times". archive.fo. 2019-02-22. Retrieved 2019-02-23. ^ Bird, Mike (2019-02-20). "Asia's Most Radical Left-Wing Economic Program Faces a Harsh Reality". Wall Street Journal. ISSN 0099-9660. Retrieved 2019-02-23. ^ "Youth unemployment reaches 19-year high in South Korea". archive.fo. 2019-02-23. Retrieved 2019-02-23. ^ "South Korea's president replaces top economic officials | Financial T…". archive.fo. 2019-02-23. Retrieved 2019-02-23. This page was last edited on 16 April 2019, at 20:02 (UTC).